Over the decade and more these pages have been around, especially after the last three years, there really aren't many firsts left to be had. ...but this time, it'll all be in Italian. 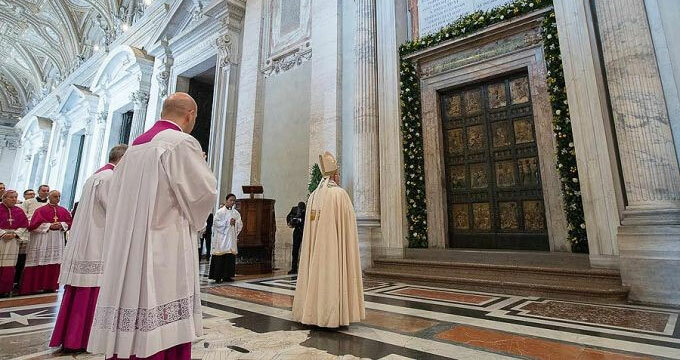 As never before, tomorrow the entire world will be able to witness the beginning of a Holy Year in the moment as the Pope launches the Jubilee of Mercy for the global church by pushing open the Holy Door of St Peter's at the end of a 9.30am Mass for the feast of the Immaculate Conception, a moment even more intended to mark the 50th anniversary of the close of Vatican II. Whether by happy Providence, a striking sense of calculation – or, perhaps, a bit of both – the inauguration of this first off-cycle Jubilee ever dedicated to a theme instead of a specific event likewise falls on the 1,000th day of Jorge Bergoglio's ministry as 266th Bishop of Rome. Along those lines, it is deeply telling that – having cribbed an Argentine grandmother's note at very his first Angelus that, without God's forgiveness, "the world wouldn't exist" – Pope Francis made "experiencing God's mercy" his global intention for this December in the monthly papal petitions which he submitted to the Apostleship of Prayer in early 2014, a full 14 months before his declaration of a Holy Year at a Lenten Penance service during which he (again) broke protocol to go Confession himself before guiding others through theirs. Having spent his Petrine ministry to date showing doors to the world where many thought only walls existed – and journeying to three continents he'd never previously seen in the effort – for Francis, the Catholic "Doorbuster" special that begins (not coincidentally) on Rome's traditional Christmas-shopping launch represents the intended centerpiece of his pontificate: in his own words, no less than a "revolution"... and just its start at that. While what'll ensue in the global, programmatic sense remains close to the vest – standard procedure for a Supreme Pontiff who's largely been able to steer clear of his Curia's leak-prone ways – perhaps this Jubilee's most feverishly awaited (or feared) part is already on the clock: amid the loud, yet mostly esoteric clamor in the wake of October's Synod on the Family as its papal last word is in the works, Francis' stated prayer for March 2016 begins with a call "that families in need may receive the necessary support." Indeed, in no shortage of ways, this has been a breathtaking year on this beat and then some – and just as exhausting, to boot. The months to come aren't looking to let up much if at all... especially given the costs involved in covering these last few months, though, keeping on here for whatever lies ahead means keeping after the bills this work racks up. Not that that's easy, but as ever, it is this readership's part. For just one example, the live text-feed run here over the climactic day of last month's USCCB plenary rang up $850 in server costs due to the traffic that clicked in here for it. Put simply, folks, when you're reading or watching anything here, this scribe is paying for it... and this latest hit's come on top of the usual costs of covering Plenary Week, on top of what remains to be paid from the PopeTrip, on top of whatever's left over for this scribe's wage, benefits and life, to say nothing of what's yet to come. Back to the story, in the broad frame as this Jubilee begins, a certain moment looms large in this sinner's mind. Eerie as the scene now feels, it wasn't all that long ago when Francis George stood over the casket of Andrew Greeley – albeit in very different ways, each a giant of the Stateside Church, but both united, among other things, in knowing that their time wasn't long. And he didn't pause at all. I expected him to say the glorious music, the marvelous melody; instead he said, 'It's the most Catholic of the operas, because in the end – in the end – everyone is forgiven.'" And so, to one and all, may this Year and its graces be yours in abundance... buckle up.